Sentimental mood music done with skill and taste. The mandolin with its balalaika accent meets the serenading guitar. The selection is generous and the choice well guided. It will not do as unassuming audio muzak. It mixes eras in a lively way. Much of the music is at a slow pulse and some has a sultry Iberian savour. The Paganini follows the superb Piazzolla suite. Freshly inventive pieces such as the fast chant determination of the Kangro contrast with the spiffing nineteenth century flashiness and tremolo of the Munier pieces. The Aria variata is well worth getting to know. I expected the Sumera to be worth waiting for and it was. It starts with strummed chords from the guitar like the riffs from Pinball Wizard with the mandolin keeping up a fast-pecking pulse. The mandolin is called on to chuckle and hesitate but both instruments also have to keep up regular minimalistic ostinati; neither is allowed exclusive lead status. The mandolin's ascent to dizzily plucked heights at 3.15 is specially memorable. 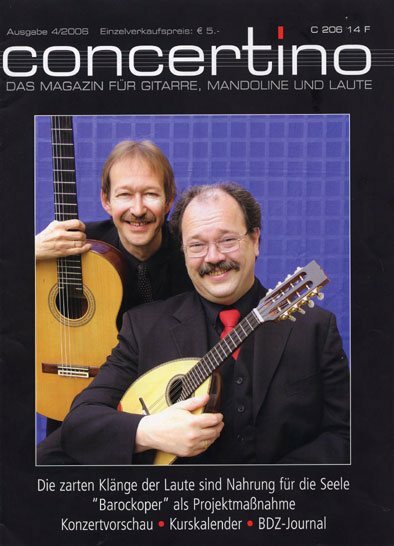 How surprising as well to find Kodaly arranging Bach for guitar and mandolin ... but it works well. The Preema, Kangro and Sumera pieces were specially written for Bagger and Tewes. They were the arrangers of the Marucelli, Munier and Paganini. The contrived slider fade at the end of My Way (the last track) was, I think, a miscalculation however you can programme the sequence from your remote - although how many do?